He traces his fingers over a map with 85 pushpins that mark the countries he’s visited –– where his old passport photos are posted, showing his evolution from curly dark hair to short silver strands. When he puts on his leg braces each morning, Fred Noble, 74, likens the process to the many times he put on ski boots –– right up through last spring. For most tasks these days, he draws an analogy to his adventures. 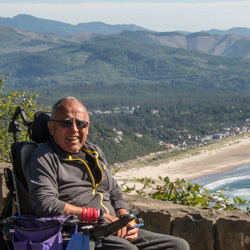 Noble, famous local adventurer, is the honorary chairman of the inaugural Ski to Defeat ALS event, sponsored by the ALS Association of Oregon and Southwest Washington. The April event at Mt. Hood Meadows will raise money for services and education the association provides. Led by Noble, “Team Fredinator” plans to raise $10,000 and is more than halfway to its goal. Though he’s now using a wheelchair, Noble took up “sit skiing” in early January, and plans to return to Mt. Hood Meadows next week for another round. His skis splayed out, his football jersey and pants froze, and he had to use wool socks as mittens, but Fred Noble was hooked after his first ski trips to Government Camp in 1954. At the time, Noble was 17 years old and earned 65 cents an hour sweeping rooms to pay for a school house room in Southeast Portland, where he attended Franklin High School. Spending part of his childhood in a California orphanage, Noble eventually ran away to carve his own life in Oregon. An adventurous spirit was always a part of him, leading him to pristine backcountry where no one else skied, and introducing him to a plethora of adventure sports. A longtime Portland resident, Noble has spent more than 50 years extreme backcountry skiing, paragliding, wind surfing, scuba diving, rock climbing and doing adventure photography. He began appearing in Warren Miller ski movies in the 1980s, and with friends helped to popularize wind surfing in the Columbia River Gorge, making it more accessible to the public. His proudest accomplishments, though, are his four children, seven grandchildren and numerous friends spread throughout the world. His grandsons, who call him Turbo Grandpa, got tattoos in tribute to Noble. The past six months have started to slow him down. His lungs give him trouble, and he can no longer use his legs. Next month, he expects to get a feeding tube, and he will have to “bank” his voice on a computer. Today, Noble continues his work as the North American representative for a Canadian-based ski and travel company that takes people on heli-ski and heli-hike tours to remote mountains only reached by helicopter in Canada. He and his family have been remodeling his home, which fittingly includes a rope course-like system that makes Noble feel like he’s on the mountain. Noble and author Phil Favorite are working on a book about his life, and photographer friends of his who’ve worked for National Geographic are working on a documentary about Noble. Noble also blogs, offering candid reflections about his battle with ALS. Noble grabs a rock climbing hold on his wall and meanders through his house, telling the stories behind the large, framed adventure photos he’s taken on his many trips. As the ALS Association of Oregon and Southwest Washington says, his spirit has inspired and brought joy to countless friends around the globe. The Fredinator keeps himself inspired, too. The ALS Association of Oregon and Southwest Washington is holding a fundraising event in April that will help families dealing with the struggles of ALS. Fred Noble is the honorary event chairman. Ski to Defeat ALS, a team and individual skiing and snowboarding event, is scheduled for all-day Saturday, April 14, at Mt. Hood Meadows. The event begins with registration at 7:30 a.m. and continues 9 a.m. to 4 p.m., with an after-party to follow. Participants are competing on the slopes for vertical feet traveled and for the most dollars raised. The event also features entertainment, a silent auction and raffle opportunities. Because the Oregon and Southwest Washington chapter of the ALS Association receives no government or insurance funding, it is funded solely by events such as Ski to Defeat ALS, as well as individual and corporate donations. This year, the ALS Association of Oregon and Southwest Washington hopes to raise $100,000 and recruit more than 500 volunteers for its first-ever Ski to Defeat ALS event. The organization encourages participants of all ages and abilities to come out April 14, whether they go down the slope once or 50 times.